If you assess Bradley Beal strictly by his on-the-court numbers, you’ll see immediately that he’s one of the most talented young stars in today’s NBA. Look a little deeper into who he is—how he treats his teammates and the people closest to him—and you’ll discover that Brad is one of the brightest, highest-character players in the league. Few professional athletes can carry the title of role model, but on and off the court, the Washington Wizards’ No. 3 strives to be one. As the rapper Nelly, a childhood friend, explained to SLAM Magazine, Brad’s future could have gone in any number of directions without having such a strong family foundation to draw from. Born on June 28, 1993, and raised in St. Louis, Missouri, by Bobby and Besta Beal, there was little doubt that Brad would eventually be an athlete. Both parents played sports for Kentucky State—Bobby was a football player, Besta a basketball player. No. 3 told the Washington Post that while Bobby taught him how to keep an even demeanor, it was Besta who taught him how to shoot. He’s a testament to good upbringing, strong parents, determination and work. Nothing was given. To see where he is now is something that you dream about for people that you care about. When he was younger, Brad played basketball and football, excelling at the latter. By his sophomore year in high school, however, Brad decided to focus on hoops. There were four other people in Brad’s family who were instrumental in his development as an athlete, and ultimately, as a young man. His two older brothers, Bruce and Brandon, and his younger brothers, the twins Byron and Bryon. Brad idolized his two older brothers. According to the Washington Post, Bruce and Brandon spent much of Brad’s youth transforming him into a warrior, while Byron and Bryon were set against him as training partners. 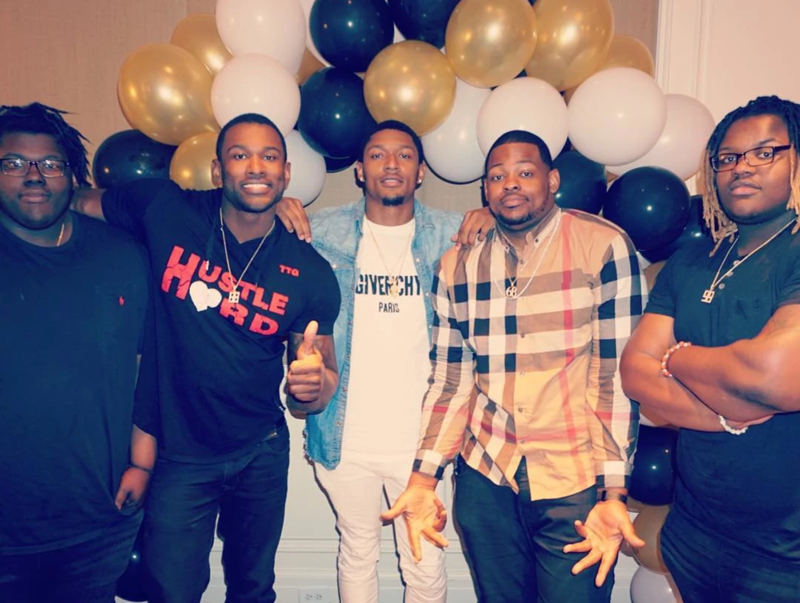 An incredible work ethic was a hallmark of the Beal family, and Brad truly began to show his when he gravitated toward basketball. His mother and father made sure to keep him focused, but when they needed help, Brad’s brothers did not hesitate to intervene. At Chaminade High School, Brad emerged on the national scene, capping off his senior season with a jaw-dropping 32.5 points, 5.7 rebounds and 2.8 assists per game. By the time Brad reached his final year of high school, he was one of the most highly recruited seniors in the nation. He had already tallied an impressive number of achievements, winning the 2010 FIBA U-17 World Championship with the U.S., and the 2011 Gatorade Player of the Year Award. He decided on the University of Florida, where he was set to play for Billy Donovan, following in the footsteps of another Chaminade High School graduate and eventual NBA All-Star, David Lee. The year started out with some difficulty for Brad, who struggled in the early months of the season. But by February and March, he had found his rhythm, and played a key role in returning the Gators to the NCAA Tournament for the first since 2007. Led in large part by Brad’s scoring, Florida reached the Elite Eight, falling to Louisville. In the end, Brad’s freshman year was an unqualified success. He was one of two players to play every game, averaged 14.8 points and 6.7 rebounds, and was the first Gator to make the SEC All-SEC and All-Freshman team in the same season. Many pundits, including ESPN’s Stephen A. Smith, felt that Brad was ready to make the jump to the next level. For Brad, it was a bittersweet ending to his college career. Coach Donovan turned out to be something of a prophet. On his 19th birthday, Brad was selected with the third overall pick of the 2012 NBA Draft by the Washington Wizards. His impact was immediate. At the NBA Summer League in Las Vegas—where as Emeka Okafor said, Brad was basically “a college sophomore”—the Wizards’ newest player was one of the clear standouts. With the NBA season finally approaching, Brad was excited to finally realize his childhood dream. Washington fans had good reason to be excited, too. Two years earlier, the Wizards had drafted point guard sensation John Wall. Now, they had a dynamic shooter to pair in the backcourt with Wall. To a large degree, No. 3’s rookie season showed the type of promise he and Washington had hoped for, but it didn’t begin that way. Wall was out with an injury for the first few months of the year, and during that time, Brad struggled. But as the blog Wizard of Awes detailed, Brad found his shooting touch as the year progressed. He’s playing the best basketball of his career. He’s more aggressive than he’s ever been, and smarter, too. No. 3 suffered a right-leg injury in April, effectively ending his season early. Still, the 56 games he played (13.9 ppg, 3.8 rpg, 2.4 apg) were enough to earn Brad third place in Rookie of the Year voting, and a spot on the NBA All-Rookie First Team. In subsequent seasons, Brad has grown tremendously both on and off the floor, learning to deal with adversity while continuing to improve his game. Those improvements earned Brad a max contract extension in the summer of 2016, which promised to keep him in the D.C. Family through the 2020-21 season. Bradley discusses his contract extension (Getty Images). According to BB, signing that extension left him with a responsibility to the franchise that wouldn’t allow him to rest on his laurels. The 2016-17 season held immense promise for the Wiz, as Brad’s new deal led Washington into a new era of sorts, coinciding with the arrival of former Oklahoma City head coach Scott Brooks. The new coach had an incredibly positive impact for the team, leading them to 49 wins, the franchise’s highest total in nearly 40 years, and back to the postseason, where they toppled the Atlanta Hawks in the first round before succumbing to the Boston Celtics in a tremendous seven-game second-round series. His play and desire to keep getting better after signing his extension harkened back to an insight he had after his rookie year about the best players in the NBA. Brad’s persistence and focus on continuing to improve his game finally paid off in 2018 when he was selected as one of hte NBA’s best players and named to his first All-Star Game. It was a career highlight for Bradley, one he won’t soon forget. 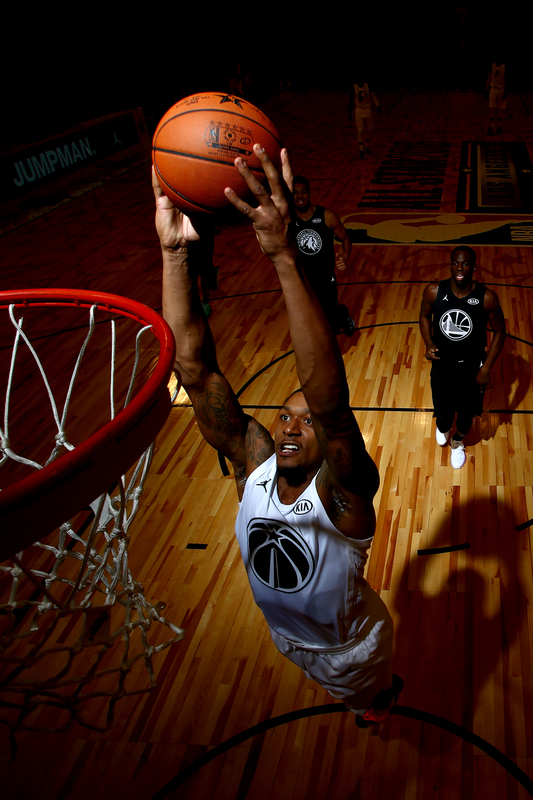 Beal in his first All-Star game (Getty Images). Bradley went on to average 22.6 points per game, just a tick below his career-best, while establishing new career-high averages in rebounds (4.4) and assists (4.5) per game. His best performance of the season, and perhaps his career, came in early December against the Portland Trail Blazers. Beal caught fire against the Western Conference’s eventual three seed and racked up a career-best 51 points in the 14-point victory. As the season progressed, No. 3 assumed more ball-handling and playmaking responsibilities with John Wall sidelined for a large portion of the season, and he was able to keep the Wizards in playoff position while Wall recovered. They eventually earned the No. 8 seed and took the top-seeded Toronto Raptors to six games but ultimately came up short of their season goals. However, Brad noted after the season that there was a lot to be learned from the adversity faced during D.C’s 2017-18 campaign and that while it may not have yielded the result they wanted or expected, it does give them the opportunity to grow. 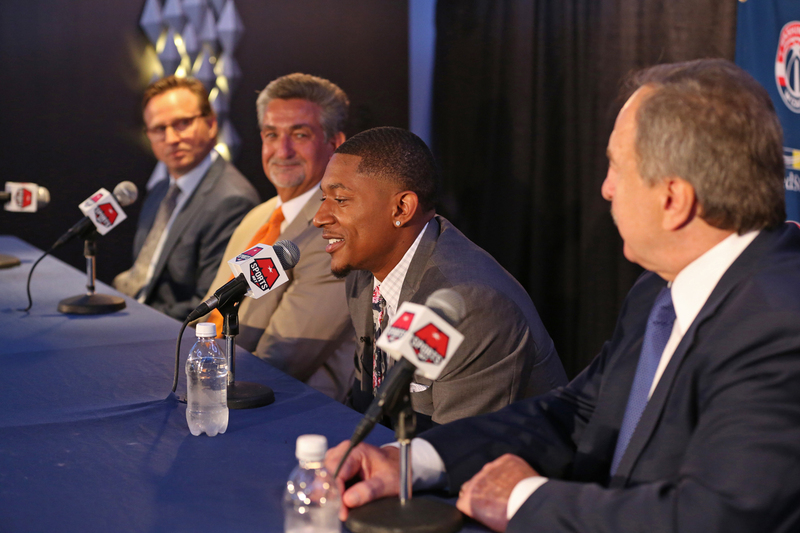 “It was a down year but there were a lot of good things, a lot of lessons we learned, a lot of positives we can take out of it as well, and we just got to get better in the summer,” Beal said. The season also gave No. 3 a lot to be proud of and even more, to motivate him, to continue improving to reach the peak of his abilities. He certainly hopes to be named an All-Star in the many seasons to come, and he will continue to work towards that goal each and every year. “It motivates me to get better and continue to be part of this every single year for the rest of my career,” he said.